Property buyers are starting their purchase journeys online. For sellers, that means your service needs to reflect the digital shift, too. And that means that live chat software for real estate businesses is essential. To connect online prospects with sellers in a click, try WhosOn. You wouldn’t ignore a customer if they walked into your high street agency and started looking at houses. You’d leap to provide immediate service, ascertaining their property needs and offering detailed advice and assistance. Without live chat, you can’t duplicate that experience online. With it, you can give the same calibre of service you’d provide face to face. Your website transforms from a mute brochure to a digital service desk, offering quality, convenient expertise that would only otherwise be supplied in-store. Improved online support means increased online deals. By qualifying and nurturing leads as they move through your website, you can bring the visitor closer to a conversion. With the tech to actively engage your prospects, you’re then free to influence and advise them. So, you can track users and see the properties they’re interested in. You can then reach out with a relevant message, offering additional info or sharing applicable offers. You can be there to answer questions and outline next steps. 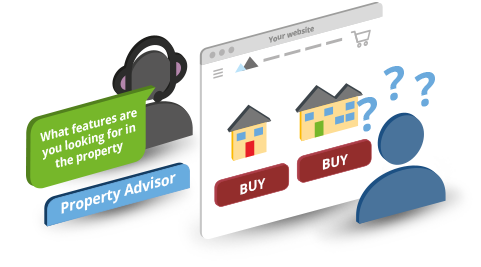 In short, you can turn passive browsers into potential buyers. The viewing is often the most essential part of the property buying process. Live chat software allows you to strike while the iron is hot and create appointments or scheduled tours immediately, directly from the chat window. 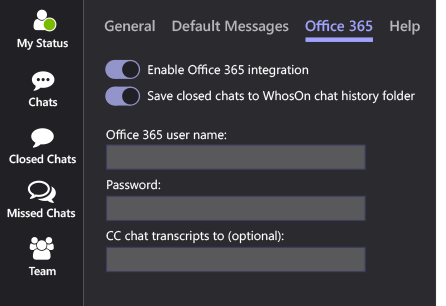 Because WhosOn integrates with both your CRM and your Office 365 account, organising a viewing couldn’t be simpler. You can arrange a suitable date and time during the session, and share that information with your calendar in a click to capitalise on the opportunity. Sometimes, prospects are looking for overseas property. Sometimes they’re simply pushed for time, or unable to keep an appointment. In instances where physical viewings are problematic, live chat software enables interactive virtual tours. Using video chat capability, you can give prospects a tour of the property they’re interested in – without them leaving the comfort of their sofa. And to keep track of conversions, all your audio conversations and recordings can be auto-saved. With live chat, you offer a single communication touchpoint for buyers. Prospects can get in touch immediately, without leaving your website, without visiting your office, without searching for contact details and without picking up the telephone. 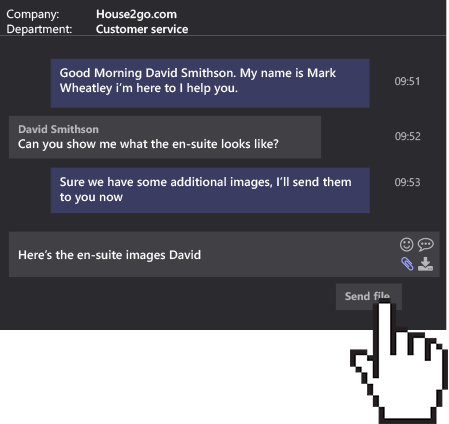 Once they’re in a chat, prospects can send and receive files directly within the window. From that same window, they can schedule call-backs. They need only one channel to communicate with you, meaning minimal disruption, maximum convenience. A potential buyer browsing your website may wish to speak to an agent with expertise in a specific region. They may wish to speak to a specific realtor mentioned in a property ad. They may wish to skip the advisory process and speak straight to a showing agent. 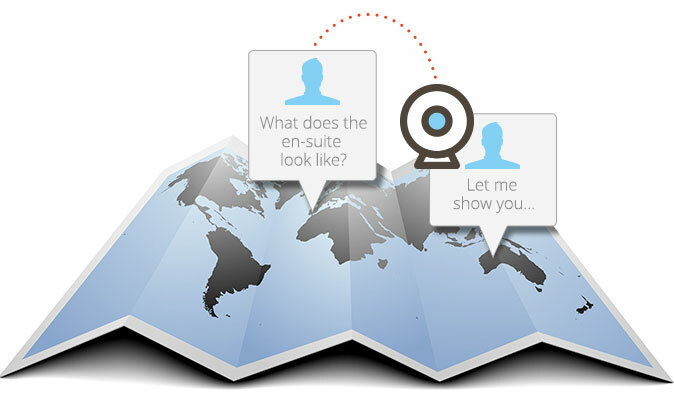 Live chat software means you can route them to the right person immediately and automatically. 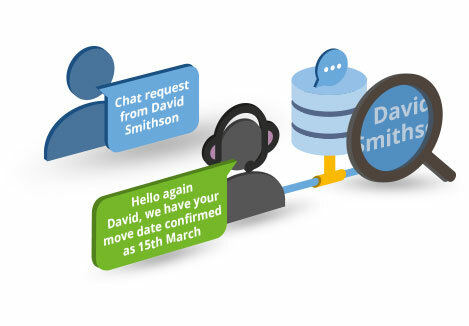 From a pre-chat survey form, the user can quickly select who they’d like to speak to and be connected directly – cutting out any messy transfers or delays. Your chat sessions are packed with valuable data. They contain contact details from new prospects, important pre-sales information about the buyer and useful records of requirements. All of this is more valuable in your CRM than it is locked within a chat window. So, WhosOn integrates with your CRM to enrich it with fresh data. 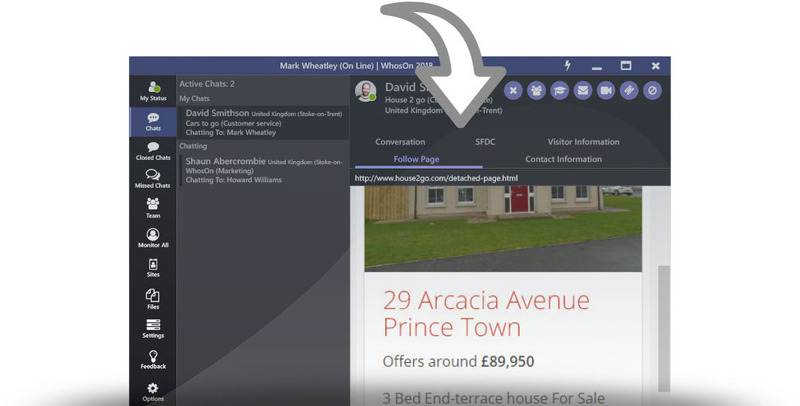 Contacts are added automatically alongside chat content, and you can even get sentiment scores to judge the likelihood of a property purchase. Your leads are always logged, never lost. Assisting buyers is quicker, cheaper and more efficient via live chat. Not only are realtors able to help multiple prospects at once, it’s easier for them to do so than it would be over the telephone or even face to face. 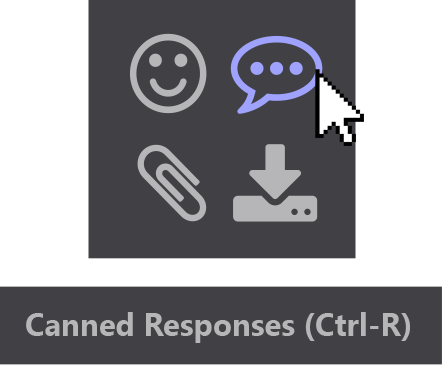 Intelligent canned responses reduce the time taken to answer questions. Typing previews give a pre-emptive insight into the buyer’s thoughts. Live language translations remove communication barriers. In short, live chat is the perfect tool for premium real estate service.